Mark Wheeler and Lee St Quinton. Three members of Skegness Tri Club travelled to Windsor’s Dorney Lake to compete in a duathlon, which comprised of a 10k run, 40k bike race and a final 5k run. Tanya Allsop, Lee St Quinton and Mark Wheeler had to battle to even park and register at the popular event. The start was delayed, meaning the introduction of a cut-off time, which saw Tanya being unable to finish the final section. Mark and Lee went on to complete the whole challenging distance. 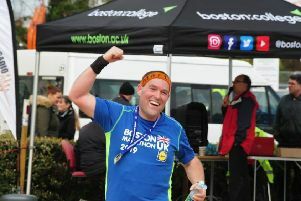 Results: Mark Wheeler: 10k run - 45-48; 40k bike - 1:15-38; 5k run - 25-57; total - 2:29-59; Lee St Quinton: 10k run - 45-03; 40k bike - 1:22-46, 5k run 28-42; total - 2:40-02. Pictured are Mark and Lee.